This helpful poster provides an easy visual for placement of leads, plus answers basic and common troubleshooting ‘What ifs’ regarding the leads, transmitter and waveforms. After you download your poster, we invite you to learn more about TeleRehab™ VersaCare, our multi-parameter telemetry solution with integrated program management and outcomes, mobile functionality and seamless EHR integration. For even more details, register for a personalized demo of VersaCare. 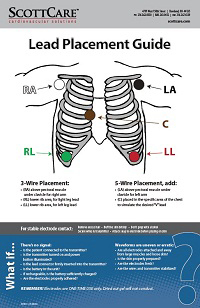 Hanging this popular poster in your rehab clinic will help guide patients in the proper placement of their leads.